200th episode – so it’s time for a gimmick! This gimmick is a play based on the dubious prophet-based Supernatural books that exist in world. A play performed by al all girls school based on those books. So we have a theatre, several young women rehearsing including Siobhan (playing Dean) and Maggie (playing Sam) and Marie, a director taking things far far far too seriously. Ms. Chandler, their drunken, frustrated drama teacher isn’t impressed by the whole thing, gets attacked by a plant. She will not be missed. Despite misgivings from last week, Sam and Dean are on the case (Dean points out hunting is his normality). Dean snarks Sam’s own theatre club at school because he’s Dean. Using their usual array of alias they get into the theatre to come face to face with a girl dressed as Bobbie saying “idjits”, another dressed as Castiel – and all the horror of not just a Supernatural play – but a Supernatural musical. With a musical number about their origin story (including mother’s death). Oh dear gods this is going to be a trainwreck. Also pulling fake FBI ID is bad because half the cast have their own which makes Sam super awkward but Dean is more concerned with his life story being turned into a musical and if they ARE going to make a musical, it should be classic rock. They do sing Carry on Wayward Son – because that’s kind of compulsory. The passionate Marie has an equally passionate May as an assistant and she nearly goes for Dean for being rude about their show – I’m kind of on both their sides. But mainly because I think Dean fighting a teenager may be better than the next musical number. Sam tries to see the positive. Dean’s facial expression says “you praise this horror show and I will flay you alive with a butter knife.” Sam stops seeing the positive. Dean and Marie head off to talk about the dead teacher and we have the obligatory slash-moment we have on every single one of these episodes because having regular, decent gay characters is completely impossible – but who needs it so long as you throw hints and subtext to slash fandom? Special points for introducing a lesbian couple (one of them nameless and neither of them characters) expressly to push Destiel slash. Sam, meanwhile, plays with the new technology and May’s endless disdain before Sam and Dean decide there’s absolutely nothing supernatural going on. But when they leave, Maggie decides the show is a load of drek as well and goes to the principle to have it cancelled just as the teacher did – Marie tries to stop her and Maggie gets attack by a giant hessian sack. It also drops a flower – the same flower that was dropped at the teacher’s disappearance. Sam and Dean come back, try to pass themselves off as themselves which doesn’t work – and the hessian sack is apparently a scarecrow – and they think it’s a Tulpa (a physical embodiment of mangled Tibetan philosophy – or an embodied idea. It’s a creature from their play). They try destroying the scarecrow prop but Sam’s research doesn’t let the episode end early, alas. Nope, it’s the muse Calliope who is doing it to inspire and protect the author – Marie – before eating her. She won’t show up until it’s time to munch on the author – so the show must go on. Or you can send each of the cast to cancel it until each is eaten and the show can’t go forwards – this is my solution. I think it’s more humane. Alas no-one agrees in mass slaughter so after Marie has a panic attack, gets a pep talk from Dean and makes a dramatic speech, she’s ready to understudy Sam. Everyone prepares and there’s a nice little shout out to Chuck not being there because Marie, Sam and Dean all hate the meta-stories (and me!) One pep talk later and off they go. 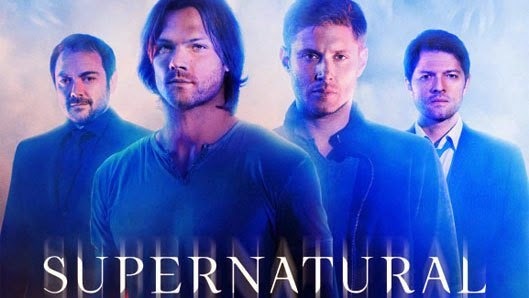 The show begins and while the girls perform, Sam and Dean play cat and mouse with Calliope’s scarecrow – and Sam is grabbed and dumped into a basement with Maggie and Ms Chandler – they’re not dead. Calliope shows up to confirm that, yes, actually Sam is Sam. Actually this episode may be worth it just for Calliope because she’s kind of awesome. Dean fights the scarecrow on stage while the girls try to keep up a musical number about brotherly bonding all the while Calliope rants about what a perfect piece of art supernatural is. Concluding with Dean, Marie, Maggie and Sam all stabbing Calliope/the scarecrow at the same time. Followed by exploding purple goo and a standing ovation from the audience. Sam and Dean drive off and Dean hangs his Samulet on the rearview mirror. And Chuck appears to speak to Marie. Aaaaaaaaargh he’s not dead. Also it had an Orphan Black shout out. Got to respect that. And yes it did shout out so many little elements from the show over 10 seasons of memorable moments. For what it was, it was perfect. As a campy, ridiculous, cheesey homage to the whole thing, it was perfect. The “single mantear” was especially on the nose. But I still spent more time cringing than enjoying – and that’s even before this show’s eternal, offensive slashbaiting and now making a joke of its homophobia that fandom gives such a pass to. I’m also kind of unsure at the whole idea of this being some kind of gifts to the fans? Doesn’t it kind of depict them as rabid, unreasonable and slightly bizarre? Points for all the female captives/targets actually getting into the stabbing.